The TZ SlideHandle™ system is an intelligent locking system for use with all major racks in data centres that allows for existing swinging doors on racks to be retrofitted. Using minimal energy the locking mechanism is composed of a special metal containing Shape Memory Alloy (SMA), which operates the doors and allows timed authorised access through ID card sensor technology. Alternatively it can be remotely triggered. 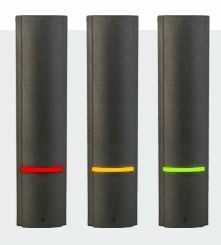 Multi-coloured LEDs indicate the locking status of the doors and are visible up to 30 metres away. TZ SlideHandle™ is powered and controlled via the TZ Praetorian™ Junction or TZ Centurion™ Bridge gateway systems. In the event of a power outage, authorised users can use a manual multi-key override in order to access the racks. A simple coloured LED system informs administrators about the security status of the door, up to 30 meters away.